As an amateur obsessed with wine, it is only too easy to focus solely on wines from the finest terroirs and the most written-about producers. But above all it is a grief that so many extremely well-made, personal and useful wines are overlooked by those who - rightly - visit Alsace. Perhaps it is within the gap between the basic cuvées and the Grands Crus that you may find the bargains that brings the most joy for money. 2007 Riesling Cuvée Spéciale is still very, very young and has an aroma which offers yellow apples, bananas, walnuts and chocolate. 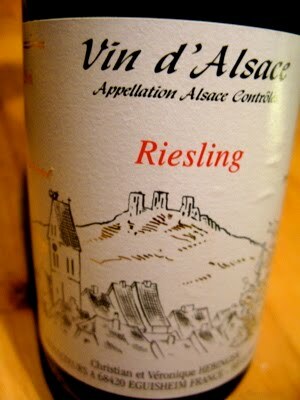 The taste is very tight, remarkably fresh with a restrained fruit that lingers in the well-structured aftertaste. Pure pleasure! Price: € 5.80.